An experiment in speed and motion! Students create a marble launcher using an index card and use a marbel, meter stick, and timer to determine the speed in which it will travel. To create the marble launcher, student will fold the index card lengthwise (like a hot dog). In my class we measured the index card and all decided to create a standard of where to place the marble to launch from. Feel free to place your mark anywhere on the index card, as long as it stays the same for each trial. For example, we measured the index card and found the middle. Everyone started their marble RIGHT on the middle line. 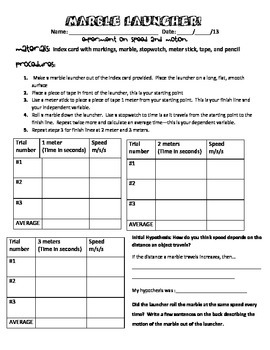 Teaches students how to work with variables, motion, and calculate speed.